God is calling, will you answer? God wants to astonish the world with his grace. And when we study the book of Acts, we see that He does it by transforming ordinary people to do extraordinary things in Jesus' name. Are you ready to be used by Him? Why do we miss our divine invitation? Where is God in our difficulty? Do I have a personal calling and how do I discover it? How does grace impact our daily lives? 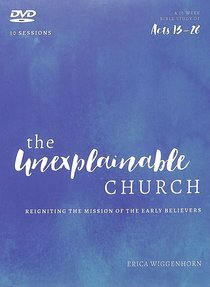 About "Unexplainable Church, the (A Study of Acts 13-28): Reigniting the Mission of the Early Believers (Dvd)"